The endemic herpetofauna of Central America: a casualty of anthropocentrism. Vicente Mata-Silva, Dominic L. DeSantis, Elí García-Padilla, Jerry D. Johnson, Larry David Wilson. General Section: pages 1–64 (e168). Ecological interactions between arthropods and small vertebrates in a lowland Amazon rainforest. 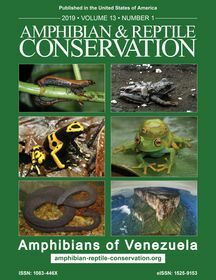 Rudolf von May, Emanuele Biggi, Heidy Cárdenas, M. Isabel Diaz, Consuelo Alarcón, Valia Herrera, Roy Santa-Cruz, Francesco Tomasinelli, Erin P. Westeen, Ciara M. Sánchez-Paredes, Joanna G. Larson, Pascal O. Title, Maggie R. Grundler, Michael C. Grundler, Alison R. Davis Rabosky, Daniel L. Rabosky. General Section: pages 65–77 (e169). 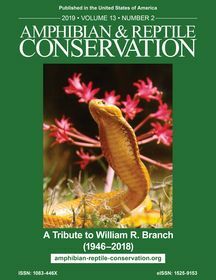 Description of head scalation variation, hemipenis, reproduction, and behavior of the Indian Smooth Snake, Coronella brachyura (Günther 1866). Dikansh S. Parmar. General Section: pages 78–89 (e164). First record of Gracixalus quangi Rowley, Dau, Nguyen, Cao & Nguyen, 2011, from Hoa Binh Province, Vietnam, including the first documentation of advanced larval stages and an extended tadpole description. Cuong The Pham, Anna Rauhaus, Thang Dai Tran, Christian Niggemann, Phuong Huy Dang, Minh Duc Le, Truong Quang Nguyen, Thomas Ziegler. General Section: pages 90–103 (e170). Genetic diversity of Egyptian populations of the African Common Toad (Sclerophrys regularis, Reuss 1833). Lamiaa Elsayed Mokhtar Deef. General Section: pages 104–110 (e171). Analysis of diet composition and morphological characters of the little-known Peruvian bush anole Polychrus peruvianus (Noble, 1924) in a northern Peruvian dry forest. Antonia Beuttner, Claudia Koch. General Section: pages 111–121 (e172). New reptile records from Lékédi Park and Haut-Ogooué Province, southeastern Gabon. Olivier S. G. Pauwels, Stephan Morelle, Jean-Louis Albert, Piero Carlino, Nil Rahola, Jean-François Trape. General Section: pages 143–161 (e174). Distribution of the Neotropical water snakes Hydrops caesurus, H. martii, and H. triangularis in South America, with new records from Peru and Brazil. Rudolf von May, Nelson Rufino de Albuquerque, Henrique Bartolomeu Braz, Roy Santa-Cruz, Emanuele Biggi, Francesco Tomasinelli, Daniel L. Rabosky. General Section: pages 122–142 (e173).